Is the Co-location (colo) Industry Dying? I’m no Nostradamus when it comes to predicting the future of technology, but some trends are just too blatantly obvious to ignore. Unfortunately, they are only easy to spot if you have a job where you are allowed (I might argue required) to observe broader industry trends. AKF Partners must do that on behalf of our clients as our clients are just too busy fighting the day-to-day battles of their individual businesses. One such very concerning probability is the eventual decline – and one day potentially the elimination of – the colocation (hosting) business. Make no mistake about it – if you lease space from a colocation provider, the probability is high that your business will need to move locations, move providers, or experience a service disruption soon. Broadly speaking, the colocation industry was built on the backs of young companies needing to lease space for compute, storage, and the like. As time progressed, more established companies started to augment privately-owned data centers with colocation facilities to avoid the burden of large assets (buildings, capital improvements and in some cases even servers) on their balance sheets. The first source of demand, small companies, has largely dried up for colocation facilities. Small companies seek to be “asset light” and most frequently start their businesses running on Infrastructure as a Service (IaaS) providers (AWS, GCP, Azure etc.). The ease and flexibility of these providers enable faster time to market and easier operational configuration of systems. Platform as a Service (PaaS) offerings in many cases eliminate the need for specialized infrastructure and DevOps skill sets, allowing small companies to focus limited funds on software engineers that will help create differentiating experiences and capabilities. Five years ago, successful startups may have started migrating into colocation facilities to lower costs of goods sold (COGS) for their products, and in so doing increase gross margin (GM). While this is still an opportunity for many successful companies, few seem to take advantage of it. Whether due to vendor lock-in through PaaS services, or a preference for speed and flexibility over expenses, the companies tend to stay with their IaaS provider. Larger, more established companies continue to use colocation facilities to augment privately-owned data centers. That said, in most cases technology refresh results in faster and more efficient compute. When the rate of compute increases faster than the rate of growth in transactions and revenue within these companies, they start to collapse the infrastructure assets back into wholly-owned facilities (assuming power, space, and cooling of the facilities are not constraints). Bringing assets back in-house to owned facilities lowers costs of goods sold as the company makes more efficient use of existing assets. Simultaneously these larger firms also seek the flexibility and elasticity of IaaS services. Where they have new demand for new solutions, or as companies embark upon a digital transformation strategy, they often do so leveraging IaaS. The result of these forces across the spectrum of small to large firms reduces overall demand. 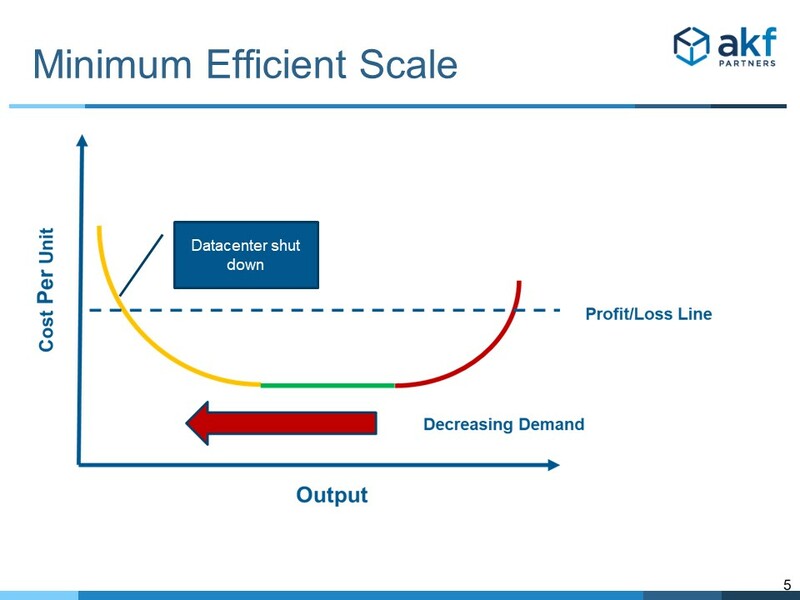 Reduced demand means a contraction in the colocation industry overall. Data centers are essentially factories. To achieve optimum profitability, fixed costs such as the facility itself, and the associated taxes, must be spread across the largest possible units of production. In the case of data centers, this means achieving maximum utilization of the constraining factors (space, power, and cooling capacity) across the largest possible revenue base. Maximizing utilization against the aforementioned constraints drops the LRAC (long run average cost) as fixed costs are spread across a larger number of paying customers. 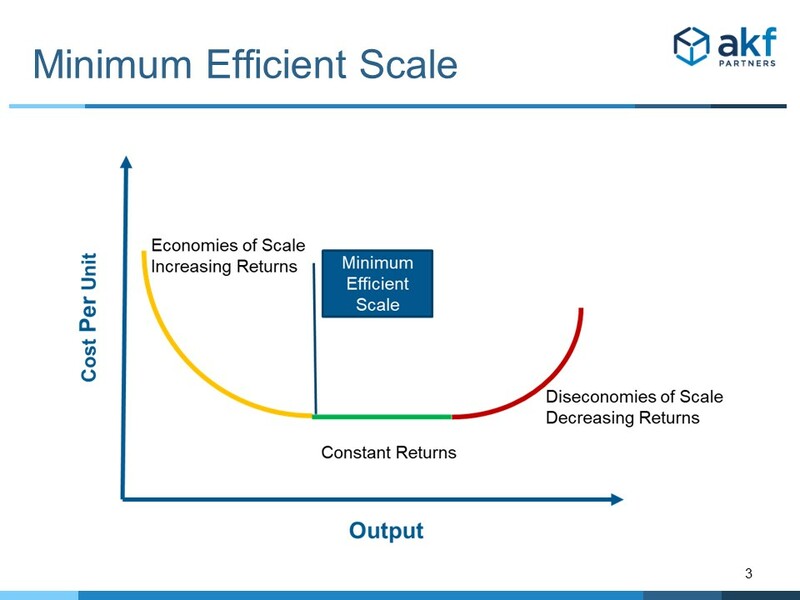 This is the notion of Minimum Efficient Scale in economics. As demand decreases, on a per data center (colocation facility) basis, fixed costs per customer increases. This is because less space is used, and the cost of the facility is allocated across fewer customers. At some point, on a per data center basis the facility becomes unprofitable. As profits dwindle across the enterprise, and as debt service on the facilities becomes more difficult, the colocation provider is forced to shut down data centers and consolidate customers. Assets are sold or leases terminated with the appropriate termination penalties. Customers who wish to remain with a provider are forced to relocate. This in turn causes customers to reconsider colocation facilities, and somewhere between a handful to a majority on a per location basis will decide to move to IaaS instead. Thus begins a vicious cycle of data center shutdowns engendering ever-decreasing demand for colocation facilities. Excluding other macroeconomic or secular events like another real estate collapse, smaller providers start to exit the colocation service industry. Larger providers benefit from the exit of smaller players and the remaining data centers benefit from increased demand on a dwindling supply, allowing those providers to regain MES and profitability. Does the Trend Stop at a Smaller Industry? We are likely to continue to see the colocation industry exist for quite some time – but it will get increasingly smaller. The consolidation of providers and dwindling supply of facilities will stop at some point, but just for a period. Those that remain in colocation facilities will either not have the means or the will to move. In some cases, a lack of skills within the remaining companies will keep them “locked into” a colocation. In other cases, competing priorities will keep an exit on the distant horizon. These “lock in” factors will give rise to an opportunity for the colocation industry to increase pricing for a time. But make no mistake about it, customers will continue to leave – just at a decreased rate relative to today’s departures. Some companies will simply go out of business or contract in size and depart the data centers. Others will finally decide that the increasing cost of service is too high. While it’s doubtful that the industry will go away in its entirety, it will be small and comparatively expensive. The difference between costs of colocation and costs to run in an IaaS solution will start to dwindle. Pricing of service per facility. If you are lucky enough that your facility does not close, there is a high probability that your cost for service will increase. This in turn increases your cost of goods sold and decreases your gross margin. Risk of facility dissolution. There exists an increasingly high probability that the facilities in which you are located will be shut down. While you are likely to be given some advance notice, you will be required to move to another facility with the same provider, or another provider. There is both a real cost in the move, and an opportunity cost associated with service interruption and effort. Risk of firm as a going concern. Some providers of colocation services will simply exit the business. In some cases, you may be given very little notice as in the case of a company filing bankruptcy. Service interruption risk is high. Environment Agnosticism: Ensure that you can run in owned, lease, managed service, or IaaS locations. Ensuring consistency in deployment platforms, using container technologies and employing orchestration systems all aid in this endeavor. Hybrid Hosting: Operate out of at least two of the following three options as a course of normal business operations: owned data centers, leased/colocation facilities, IaaS. Dynamic Allocation of Demand: Prove on at least a weekly basis that you can operate any functionality within your product out of any location you operate – especially those that happen to be located within colocation facilities. AKF Partners helps companies think through technology, process, organization, location, and hosting strategies. Let us help you architect a hybrid hosting solution that limits your risk to any single provider.